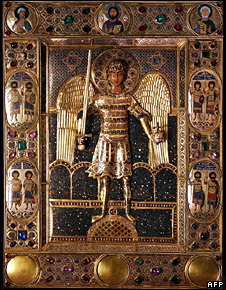 Glory Of Byzantium: An on-line exhibit from New York's Metropolitan Museum of Art. Byzantine Empire: A short introduction from a Washington State University World Civilizations course. Dionysios Stathakopoulos, "The Elusive Eastern Empire," History Today, 58 (November 2008). Alexander Kazhdan, "Byzantium: The Emperor's New Clothes?," History Today (September 1989). Eben Harrell, "A New Exhibition Uncovers The Secrets Of Byzantium," Time (October 24, 2008). Peter Schjeldahl, "Striking Gold," New Yorker (May 17, 2004). Penny Young, "The Great Palace of Byzantium," History Today (January 1999). Stephen Williams and Gerard Friell, "The Survival Of The Eastern Roman Empire," History Today, 48 (November 1998). Mark Galli, "The Great Divorce," Christian History, 16 (1997). "Academy Highlights Byzantine Art," BBC News, October 24, 2008. 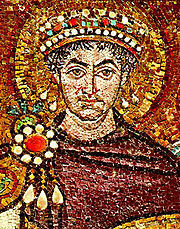 "In Pictures: Byzantine Art," BBC News, July 4, 2008. 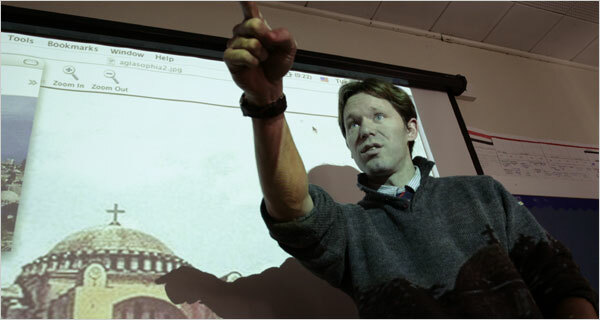 Samuel G. Freedman, "History Teacher Becomes Podcast Celebrity," New York Times, January 31, 2007. "Beholding Byzantium," New York Times, April 3, 2004. Michael Kimmelman, "Decay And Glory: Back To Byzantium," New York Times, March 26, 2004. Holland Cotter, "Reflections Of Byzantium, Where East Meets West," New York Times, January 17, 2003. 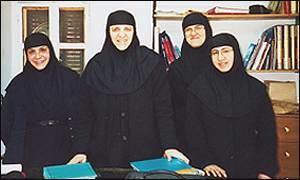 "An Unholy Row In Greece," BBC News, January 7, 2002. 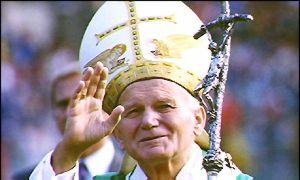 "Protesters Await Pilgrim Pope," BBC News, May 4, 2001. 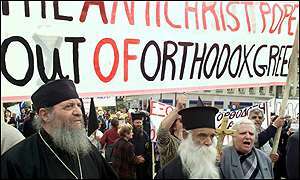 "Greek Church Accepts Historic Papal Visit," BBC News, March 7, 2001. "Analysis: A 1,000 Year Divide," BBC News, May 8, 1999. Karl E. Meyer, "The West's Debt To Byzantium," New York Times, March 30, 1997. Robert D. Kaplan, "Byzantium In The Balkans," New York Times, April 21, 1991. G.W. Bowersock, "When Istanbul Was Constantinople," New York Times, April 16, 1989.